I wanted a mid-engine car to experience the handling and there were few choices - none actually in my price range. I haven't been disappointed - the handling is great. 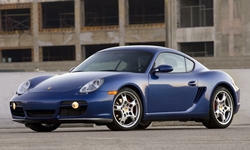 Why the 2007 Porsche Cayman? Handling is why I bought this car. It goes exactly where you point it. The Cayman and Boxster share styling, recalling the 550s, that has no extraneous details and is quite elegant with very pleasing lines. YMMV as styling is very subjective. Fortunately, I've had no chance to test the structural safety features, but the brakes are great. In conjunction with the big sticky tires, braking and emergency maneuvering is better than any other car I've owned. I traded a 911 with almost 90k miles on it for this car. There are still things I miss about that car, like the engine sound running up the RPMs, but it generally was a good car - durable but with reliability issues. It never left me stranded and this one hasn't in 40k miles either. Why Not the 2007 Porsche Cayman? Unlike older 911s, this car, and its contemporaries, is built to a price point and some things are cheapened. A notorious example is the IMS, which synchronizes the cylinder banks and valves. The bearing it rides on can fail which can take the whole engine out. I don't know whether these engines will have the potential to reach 250k miles, like the old air-cooled engines. Scheduled maintenance costs are high. Very high. But as long as its under warranty its worth having he dealer service it for some things, just in case. This is a car to enjoy the driving experience in. Truedelta has suggested a lot of pro/con subjects that I think are simply irrelevant to this car. If NVH is an issue for you or you want a lot of convenience and entertainment features, you might be happier with another car.